Olive Oil and Beyond‘s high-quality crushed extra virgin olive oils are a culinary delight. Buttery and smooth in consistency and alive with flavor, these oils will satisfy discriminating gourmets and novice cooks alike. Unlike other brands, whose process is to infuse the oil with citrus flavors, we actually CRUSH fresh, organic blood oranges and organic tree-ripened Italian olives together, resulting intense, rich flavor unmatched by other methods…you can taste the difference! A popular olive oil because of its versatility, our Blood Orange extra virgin has a refreshing citrus flavor, making it ideal for seafood, chicken and summer salads. Shrimp, scallops, salmon and halibut taste heavenly when rubbed with this oil, garlic and crushed peppercorns. 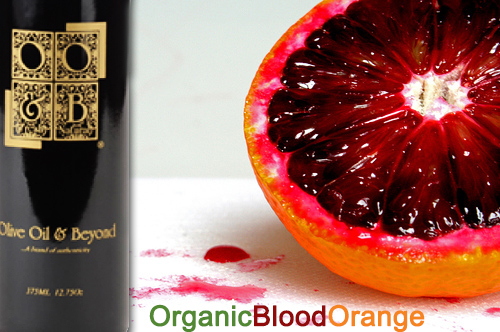 Mix the Whole Fruit Blood Orange EVOO with our Tangerine or Blueberry Balsamic vinegars for a sweet and tart vinaigrette, delicious over a salad of spinach, beets, toasted pine nuts and goat cheese. Whisk the Whole Fruit Blood Orange by itself into mascarpone, cream cheese or softened butter for a flavorful spread!Still need inspiration for dinner tonight? Check out our contest winning recipe from our contest, Orange Ginger Pork Chops!